Fort Gratiot Lighthouse is the oldest lighthouse in Michigan. 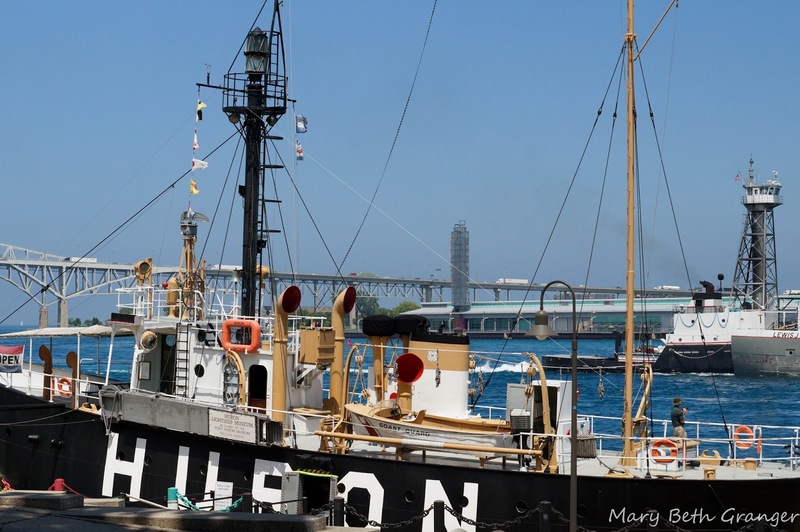 It was first put into service in 1829 and still operates today to guide ships in the area through the rapids at the head of the St. Clair River. There was originally a lighthouse built in the area in 1825 but it soon collapsed due to poor construction. The current lighthouse stands 86 feet tall. It has a green flashing light that was installed in 1933 that can be seen from as far away as 17 miles. When I visit a lighthouse I like to photograph it from all different vantage points. Before my visit I look for photos that other photographers have taken of the lighthouse. One book that is particularly helpful for Great Lakes Lighthouses is by Richard F. Edington. He gives directions to the lighthouses and then several ideas of how best to photograph each lighthouse. 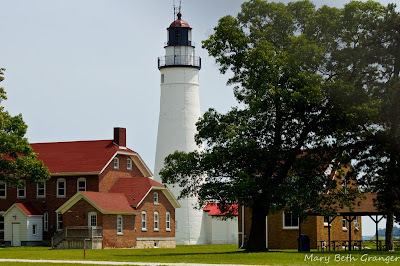 For the Fort Gratiot lighthouse I was able to follow his advice and photographed from several different perspectives. The first in the photo above is a shot I took while on the grounds of the lighthouse. The next shot in the photo below was taken from across the river on the Canadian side of the river. It is one of my favorite photos of the lighthouse. I took it in the morning when I was able to get the reflection of the lighthouse on the river. The next photo shows the lighthouse from the west side/street side. I took this photo through the fence. Next, I walked out on the beach just north of the light to take these two photos. Here are some of my photographs on a Zazzle poster. 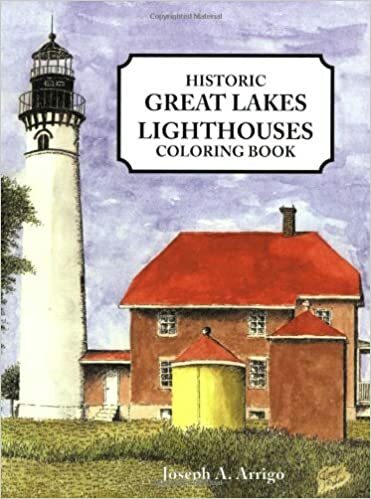 Lighthouse Coloring books are a great way to introduce children to lighthouses. Here is one I found on the Great Lakes. My granddaughters love to color these lighthouses. Lightships were used as lighthouses on the Great Lakes in places where it was not feasible to built regular lighthouses. The Huron Lightship was one of these ships and it was the last one that operated on the Great Lakes. It operated for 50 years and was retired in 1970. Today it serves as a museum in Port Huron. 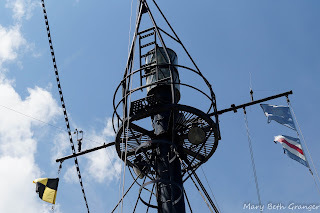 I took a tour of the lightship and was fascinated to hear about how the crew lived aboard this ship in small quarters for months at a time to keep the ships safe as they traveled the shipping lanes of the Great Lakes. During the early days of the lightships, animals such as goats and chickens were kept aboard the ship to supply food while the ship was stationed away from shore. 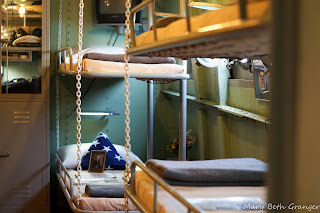 They also had their own washing machine to clean their clothes and clotheslines hung in the ship. There is a small galley for cooking and room for several sailors to sleep. 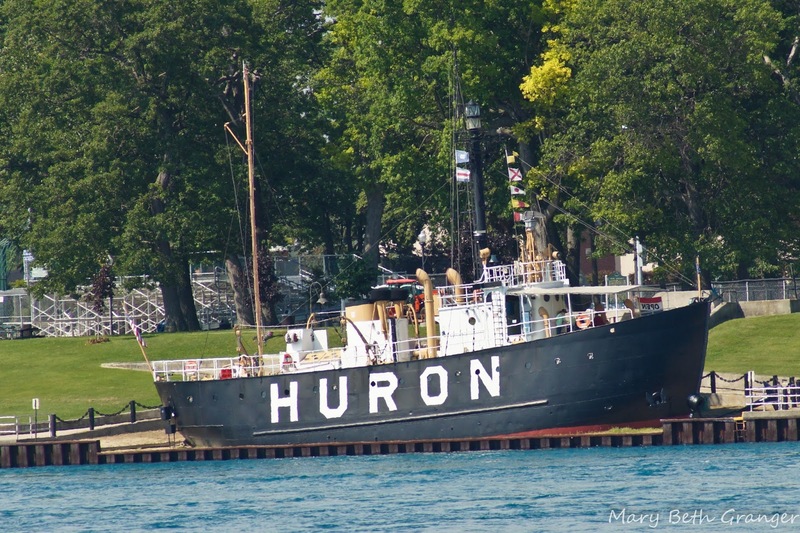 For 36 years the Huron Lightship was stationed at Corscia Shoals a sandy area 6 miles north of Port Huron Michigan. 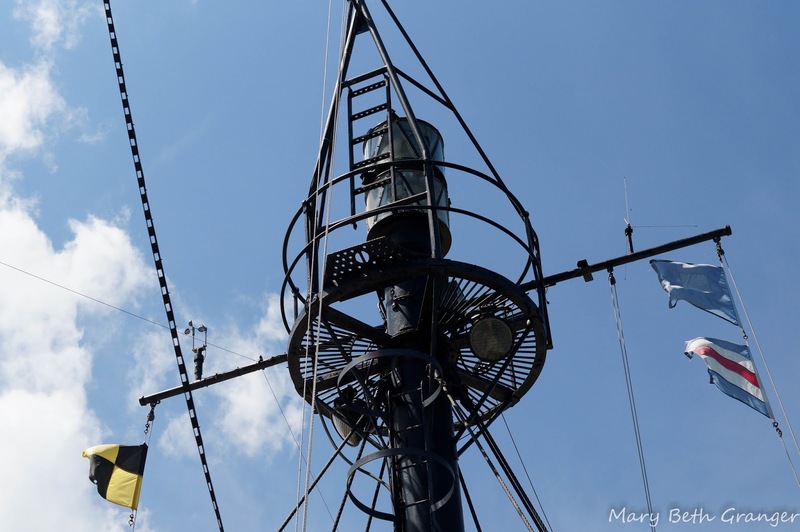 The photo below shows the lantern that sits atop the mast of the ship. I have always been drawn to lighthouses, but in 2007 I retired and my interest in lighthouses really started to peak. 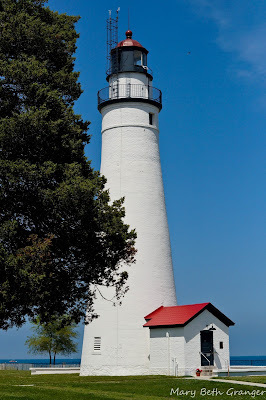 I bought a new camera and my husband and I began to plan trips around photographing lighthouses. In the years since I have photographed over 100 lighthouses and always look forward to finding the next lighthouse to photograph. I have been amazed at how there can be so many different types of lighthouses. 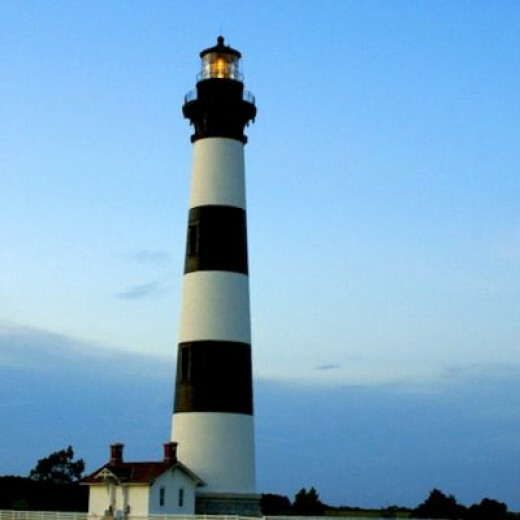 I had always thought of the tall thin cylinder type lighthouses but I have learned that there are many more varieties. 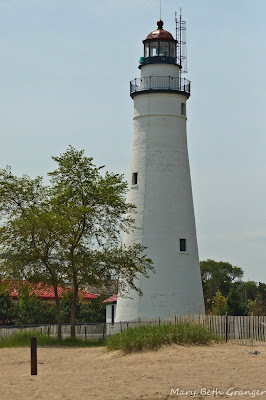 Besides photographing lighthouses I have enjoyed learning about the history of each lighthouse and in several cases I have been able to climb the lighthouse and visit museums about the lighthouse. I also enjoy writing about lighthouses. I love sharing my photos and what I have learned. With lighthouses there is always something new to learn and I'm anxious for my next lighthouse adventure. All photos on this page are by mbgphoto. I thoroughly enjoy photographing lighthouses. Each lighthouse has it's own unique look and character and I try to capture it in my photographs. Since we photograh most of the lighthouses when we are traveling and have a limited amount of time, I'm not always able to choose the best time for lighting and the best angles. so my challenge is to find a way to capture an image that depicts each particular lighthouse. Some lighthouses are on shorelines that give me an open space to photograph but others have buildings and houses that have grown up around them making it difficult to get a good shot. When I first started photographing lighthouses I was a bit afraid to make the trek to the top. 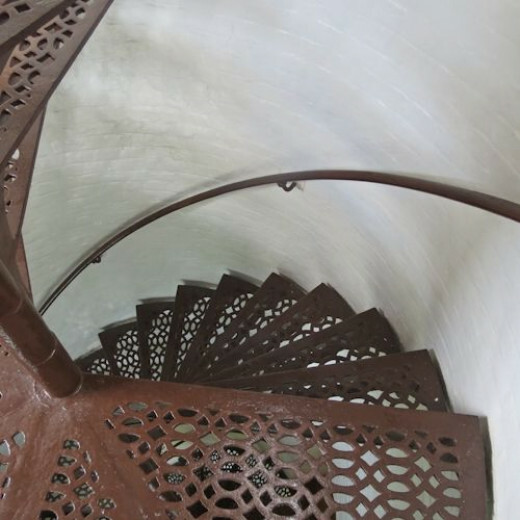 Many of the taller lighthouses have over 100 narrow and winding stairs to the top. I first tried to climb Jupiter lighthouse and only could make myself go out half way to the top. I did get some good photos from the landings and although I would have loved to go all the way to the top I just couldn't make myself. One year we were with some friends at the Hunting Island lighthouse in South Carolina and they coaxed me to climb to the top. The view was breathtaking and well worth overcoming my fear of the climb. You see the heights don't really bother me once I'm at the top, it is the climb that makes me fearful. The next year when we were in Jupiter, Florida I finally climbed that lighthouse to the top and it was well worth the climb. Since then I have climbed lighthouses in Maryland, Michigan and Minnesota. These lighthouses are all shorter lighthouses and the climb is between 35-60 steps so they are not nearly as intimidating. In all cases the views have been worth the climb. It gives you a whole new appreciation of what it must have been like as a lighthouse keeper. This photo shows the view from atop the Hunting Island Lighthouse. 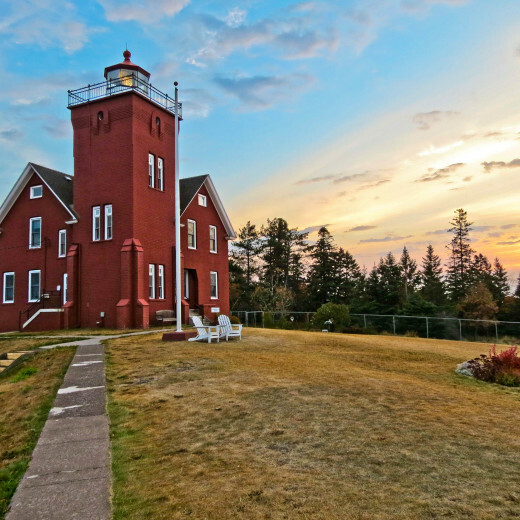 I was thrilled when in the fall of 2012 my husband and I were able to stay in a lighthouse bed and breakfast in Two Harbors, Minnesota. I was able to photograph the lighthouse at all hours of day and night and I even climbed the tower in the middle of the night to watch the ships come into the harbor. It was a fantastic experience. In this photo you see the lighthouse at dawn. I got up very early to go outside and catch the sun coming up behind the lighthouse. At this point I have visited many lighthouses on the east coast but very few on the west coast. I'm hoping that will change in the coming years. This will be a list that I am hopeful will be added to each year. 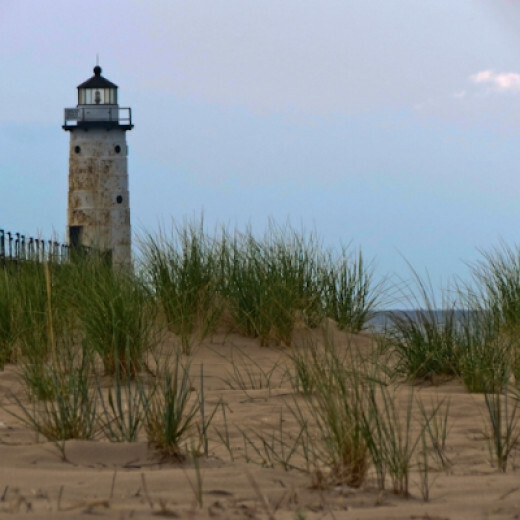 Many of the US lighthouses are located on the shores of the Great Lakes. 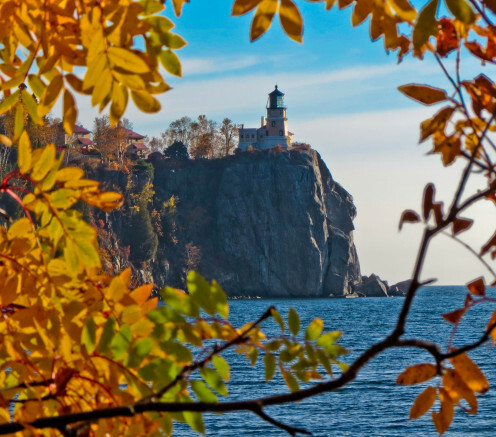 The Great Lakes have historically been an important part of the shipping industry and in the past lighthouses were important to keep the ships safe and guide their way through some of the narrow passages. 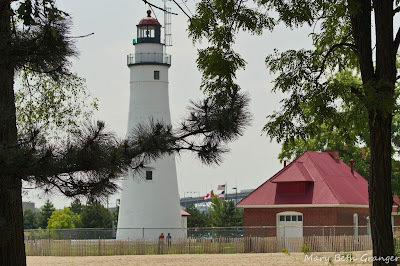 I have visited photographed several lighthouses outside of the US. The ones below were in Canada. Mexico, Columbia, Panama and the Bahamas. 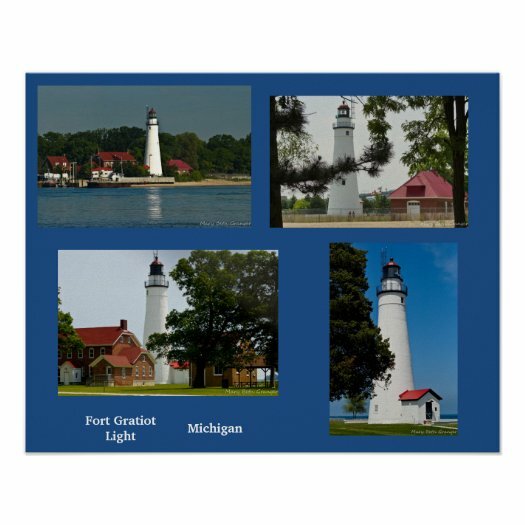 I enjoy displaying my lighthouse photographs on Zazzle products. 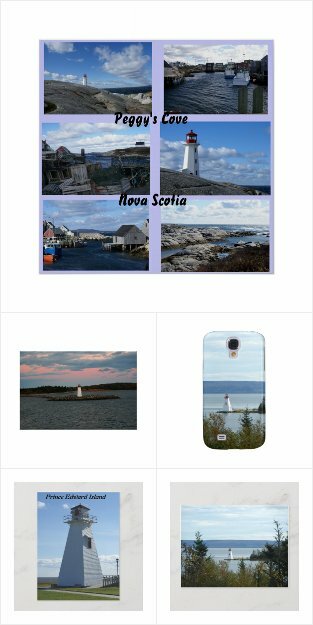 Below are just a few of the items you can find in my Zazzle store. 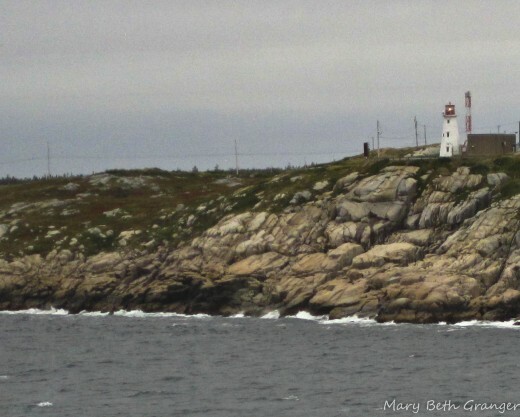 I had heard about the interesting lighthouses in Nova Scotia and was anxious to photograph them. 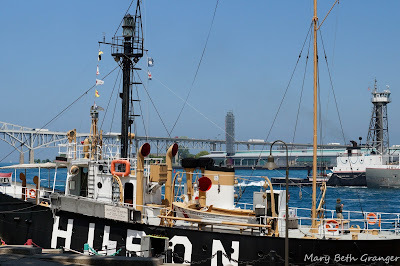 In the fall of 2010, a group of us went on a cruise that started in New York City and stopped at several ports in Nova Scotia as well as Prince Edward Island and Quebec City. I knew it would be difficult to photograph lighthouses when I was at the mercy of the cruise ship and touring schedules, but I was hoping to catch a glimpse of a few. I signed up for a tour to Peggy's Cove lighthouse so I knew that at least I would be able to capture some images of that highly photographed lighthouse. 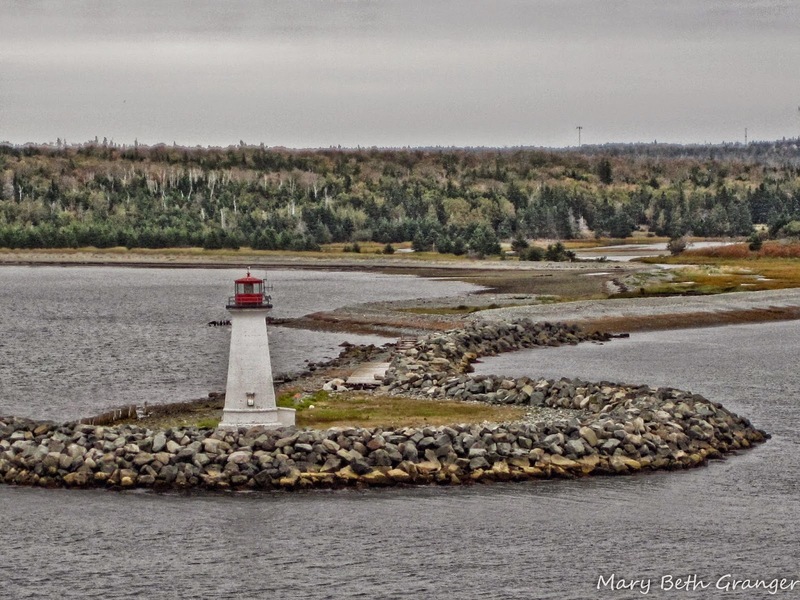 I was happily surprised when I was able to photograph several other lighthouses as the cruise ship stopped at the various harbours in Nova Scotia. 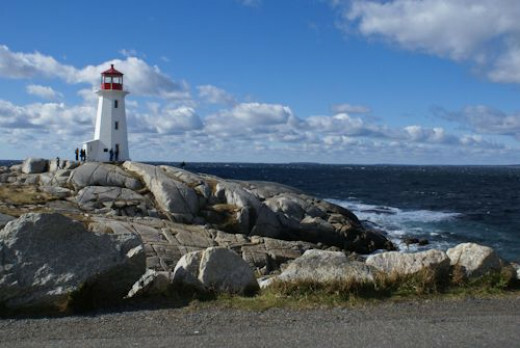 I learned that Nova Scotia has more lighthouses than any other province in Canada. 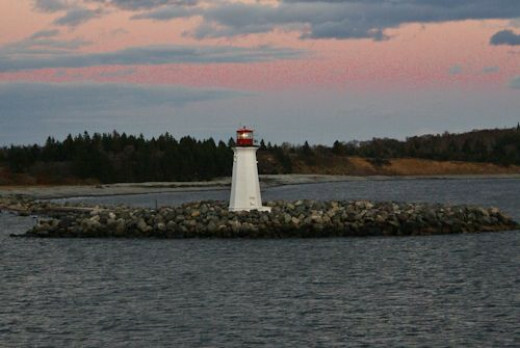 170 lighthouses dot the shores of Nova Scotia. I was able to photograph 6 of them on my cruise. Prince Edward Island has 50 lighthouses and I was able to photograph 4 of them. 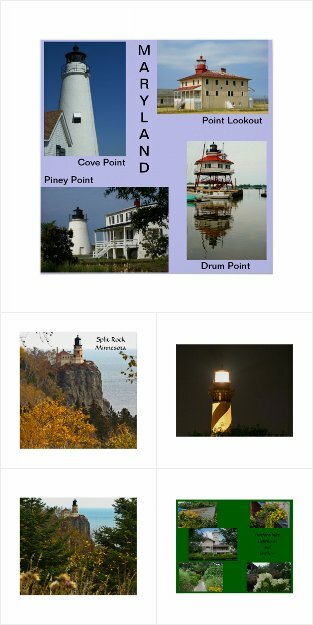 I found the shapes of many of the lighthouses to be quite unique (or at least different from those I was used to on the eastern coast of the USA). In 2014 we returned to Nova Scotia and Prince Edward Island for a second visits. I have added more photos of lighthouses from that trip. 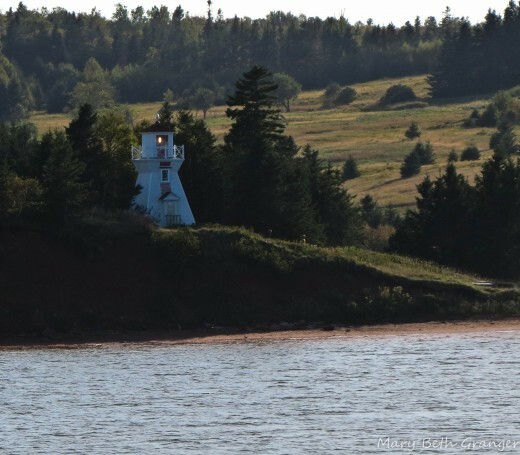 This page will serve as my introduction to the lighthouses in Nova Scotia and Prince Edward Island. I hope you enjoy my photographs and my musings on my lighthouse visits. I took this photo of one of the lighthouses in Halifax Harbour at dusk as the cruise ship was leaving the harbour. 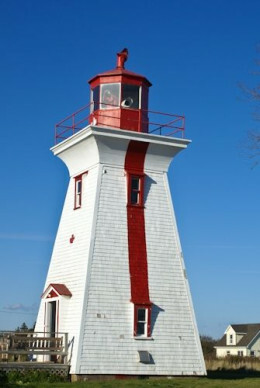 The lighthouse is on McNab's island. We were not given any information on the lighthouses that we passed on the cruise ship so my information comes from searches on the internet. I tried to match my photos with photos online and the places we had visited so it is possible a name or two could be mistaken. At any rate there were lots of lighthouses that we passed as we entered the ports. All of them seemed to be much smaller than many of the lighthouses I have seen on the US coasts. This lighthouse was located in Halifax harbor right where our ship was docked. I was able to capture some good photos from the decks of the ship. I had read a lot about Peggy's cove and I was really excited to be able to photograph the lighthouse. I was hoping for good weather and I was not disappointed. The bright blue sky with white fluffy clouds made a beautiful backdrop for my photographs of the lighthouse. It was a very windy day and even the rough look to the sea added to the photos. 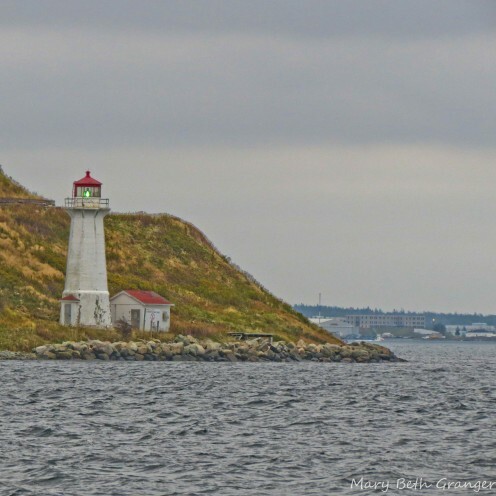 I photographed this lighthouse as the ship was pulling away from Halifax. It was just at the entrance to the bay high up on a rocky hill. 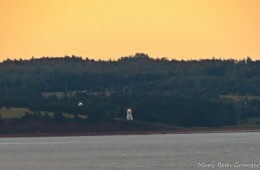 Double lighthouses seen as ship was headed toward Charlottetown in Prince Edward Island. Prince Edward Island was a great stop on our cruise. When we arrived in port we took a cruise and was able to see a bit of the countryside. Of course, I was thrilled to see the lighthouses on the island. 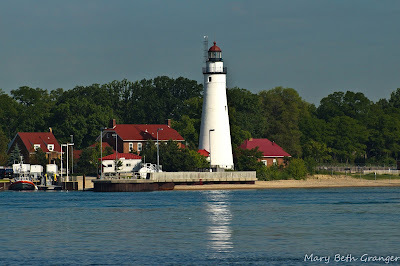 As you can see from my photos they are different shapes than many of the lighthouses we see in the US. I was even able to climb to the top of one of the lighthouses. It was only a few short steps...I'd say 20 or less. 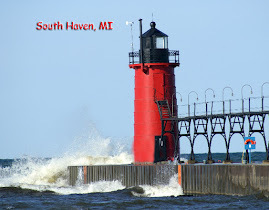 Most of the lighthouses I saw were painted red and white. On Prince Edwards Island you see things about the famous children's class, Anne of Green Gables. I was able to buy a book and doll for my granddaughter. We also saw many small churches throughout the countryside.